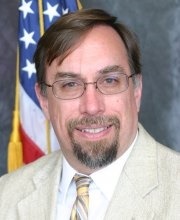 David Riggs, Ph.D., is Professor and Chair, Department of Medical and Clinical Psychology (MPS) at the Hérbert School of Medicine at the Uniformed Services University of the Health Sciences in Bethesda, Maryland and also serves as the Executive Director of the Center for Deployment Psychology (CDP). As Professor and Chair of MPS, Dr. Riggs leads the Ph.D. program to train active duty psychologists for the military services as well as civilian clinical psychologists who train as scientist-practitioners to deliver outstanding patient care and contribute to clinically-relevant science in psychology. As Executive Director of the CDP, Dr. Riggs oversees the development and delivery of training seminars for behavioral health professionals to prepare them to provide for the needs of warriors and their families. Dr. Riggs earned his doctorate at the State University of New York at Stony Brook and completed a clinical psychology internship at the Medical University of South Carolina. Prior to taking the position to lead CDP, Dr. Riggs held clinical research positions at the Center for the Treatment and Study of Anxiety at the University of Pennsylvania and the National Center for Posttraumatic Stress Disorder (PTSD) at the Boston Veterans Administration Medical Center. As a clinical and research psychologist, much of Dr. Riggs’ work has focused on trauma, violence and anxiety with a particular interest in the impact of PTSD and other anxiety disorders on the families of those directly affected. He has trained and supervised numerous student and mental health professionals from the United States and other countries in techniques for treating PTSD, obsessive compulsive disorder (OCD) and other anxiety disorders. This included training professionals in ways to address the emotional and psychological needs of survivors of combat, international terror, natural disasters, and sexual and physical assault. Dr. Riggs has published more than 80 articles and book chapters and presented more than 250 papers and workshops on topics including PTSD, domestic violence, and behavioral therapy.